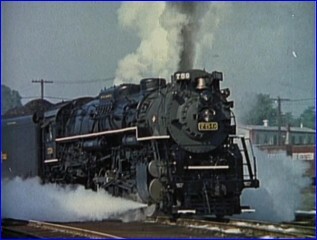 Locations: System wide, Western Maryland, TP&W and more..
Color coverage of Nickel Plate Berkshires in vintage years. Begins with classic 1950’s era. The 759 and 765 led specials, 1970 until 1980. 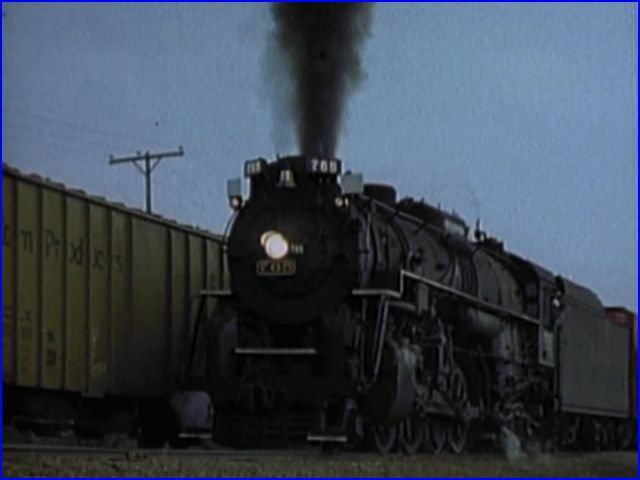 This collection of films contains many various views of the steam engines. Sectioned by the timeline in ascending order. This release is a 2010 remaster. An action packed half hour show. Alva Morrison combined these individual films into this program. All the vintage films appear to be 16mm. 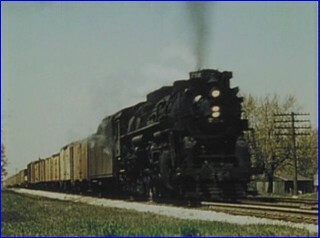 The more modern footage appears to be video. These color films look fine. There is a step up in clarity for 1970 onward. Environmental audio on the more recent footage. Dubbed audio on earlier years. Each chapter has it’s own style. Standard runbys dominate the proceedings. Aerial footage has various views. Close-up and distant from the aircraft. This 1950’s scene captures the essence of Nickel Plate freight service. A Berkshire, perishable cars and making time on a straightaway. High Speed Service. 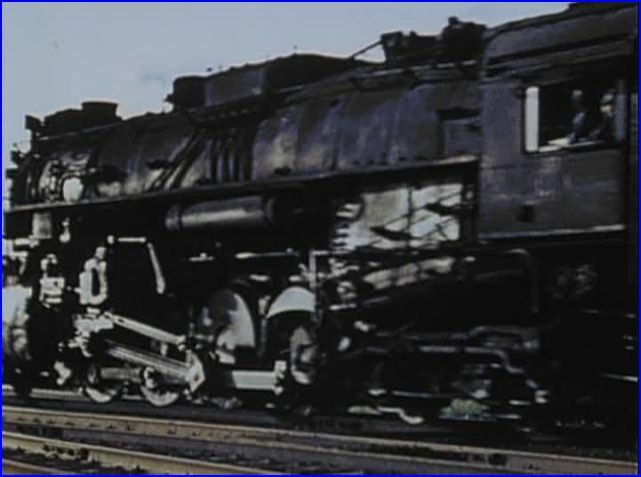 Steam era footage by Jerry Carson is enjoyable. Narrated by Alva Morrison. Alva shares much background on the railroad and it’s dedication to operating steam, throughout the 1950’s. Fort Wayne Railroad Historical Society had 759 in revenue freight service circa 1980. This aerial provides a model railroad type of scene. There is camera shake as we follow the train from the sky. Western Maryland trackage. Trestle crossings are a highlight. Chapter menu divides the show into: Prime, 759 in: 10/70, Spring 71, Summer 1980 with 765. Overall, the films are generally runbys. 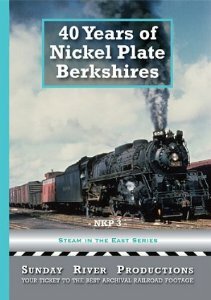 40 Years of Nickel Plate Berkshires has an appeal that will be a good choice for family viewing. Everyone likes to see big steam at work. The fast pace and continuous action will entertain anyone with steam train interest. 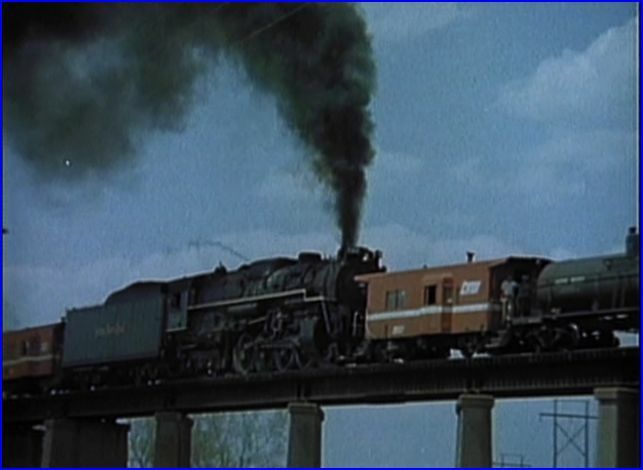 This entry was posted in ATVR Reviews and tagged American Train Video Reviews, Coal, Railroad, Steam, Steam engine, steam train, Train DVD, train video reviews, transportation by William J. Hudson. Bookmark the permalink. William: Many thanks for another positive review. We always appreciate your attention! Thank you, Alva. Sunday River has enjoyable shows!